PokeGo++ has been updated to the 1.107.3 for iOS. You can now hack pokemon go easily. So there remains only Pokemon Go++ hack for Android and iOS that we can use to hack Pokemon Go and bypass real life walking. Poke Go++ ipa hack file is installed via Cydia Impactor tool. And all this process does not need jailbreaking. On Android Poke Go++ is installed via Fly GPS. And that gives you joystick to move along with GPS spoofing. To download Pokemon Go++ Hack on iOS and Android you can follow the instructions below. At the time only this hack works properly and gives PokemonGoAnywhere with joystick. TutuApp is not providing the hacked Pokemon Go version instead it is giving the regular version because Niantec has updated its Antihacking system. Now Pokemon Go is difficult to hack. Cydia Impactor is a tool for iPhone/iPad that is used to install custom sideloaded apps without jailbreak. Android users can install Fly GPS as Pokemon Go++. Poke Go++ and Pokemon GO++ are same. So, lets start to install the hack. 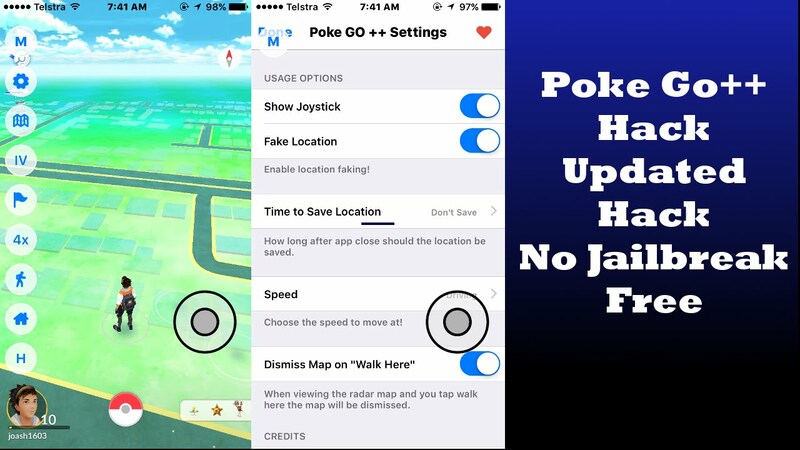 Follow these instructions below install Poke Go++ hack on your iOS device. First of Download Cydia impactor on your windows PC or MAC. Now download the hacked Pokemon Go++ Latest version from below button. Extract the download pokemon go which is in zip file. Now connect your iPhone/iPad to PC or Mac. Launch Cydia Impactor that you downloaded and installed in the first step. Note: Delete any previous Pokemon Go from your phone. After that it will ask you to sign in. Sign in using your Apple ID. An Apple Developer Warning box will appear now. Click on OK.
After the ipa file installs on your phone. You can disconnect the device from the computer. After that you need to trust the Pokemon Go app you just installed via Cydia impactor. Go to Settings on your iPhone. Open General and then tap on Profiles. Scroll down and trust the Pokemon Go profile. All Done now. Launch the newly installed Pokemon Go. Sign in and Enjoy playing with Joystick and hacks. Follow the steps below to install Poke Go on Android phone. Unlock your phone and Connect to an internet connection. Download latest Fly GPS hack on your Android phone. Once you have installed it. Go to this detailed Fly GPS Tutorial. See the instructions given at the end on how to use Fly GPS. And there you go. You have installed Pokemon Go++ Hack on Android/iOS aka Poke Go++ hack. Drop your Comments below. Please share it and subscribe. Follow us on Twitter, Facebook. Pokemon Go++ is a hacked ipa version of Pokemon Go game with joystick. This hack can bypass real life walking in Pokemon go. You can walk with joystick without actually walking yourself and catch many pokemons. Above is the update of Pokemon Go++ 1.107.3 version for iOS and android with steps to install it. This is working fine. Thanks. Huawei P10 Lite, Android 7.0, FlyGPS works, but Pokemon Go says Location not found. I can travel everywhere, but the game won’t load the pokemon nor the pokestop. Can I solve this somehow? same problem here whats wrong with it????? Same problem with Android 7 on S7 Edge: Fly Gps > Location not found. Can help ? Please…. YOU MUST RESPOND WE ! Now that there is the Android update, Fly GPS and other spoofing apps are not working….we need one like the IPA in Android phones…kindly help. This file marked PokeGo 1.37.1 hack.ipa is not downloading the current version of the game. Its downloading 1.33.4 / 0.63.4. I’m having the exact same problem… On all links I can find.